When you pushing the stroller but you find yourself propping baby's bottle or your drinks against the handle of the pushchair, it is perfect solution for you! It is a must have accessory for baby strollers. This lightweight stroller cup holder works with most baby strollers. It is simple, unique, durable and practical as well. It is designed with room for all your needs is the perfect solution for all your personal essentials right at hand, which makes your life much easier when your out with your kids. ATTACHES TO MOST STROLLERS - This lightweight stroller cup holder is perfect to hold baby milk bottle in your stroller and will make you more convenient! You will finally be able to store bottles in safely and efficiently place! 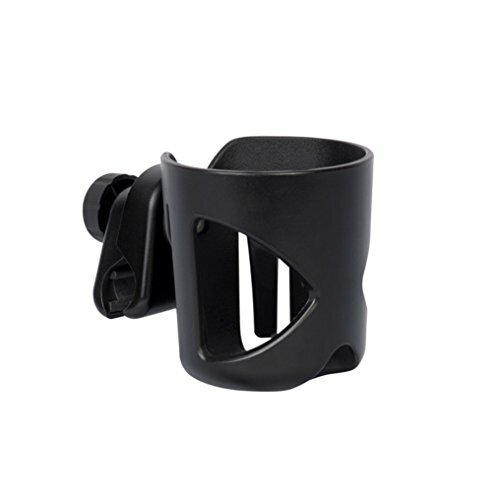 MATERIAL QUALITY - Our universal stroller cup holder is 100% brand new with good quality control, performance indicators, and manufactured to the higher industry standard. Made from high quality polyester materials, sturdy and durable. UNIQUE DESIGN - It is designed to keep the cup secure and safe from spills. Very lightweight and simple to install, you can get it ready without any tools. Strong enough to hold a slurpee, easy to remove to clean. CONVENIENT & VERSATILE - Perfect for mountain bike, bicycle, wheelchairs as well. It has a mechanism to prevent unwanted spills when strolling. SUITABLE TO APPLY - Attaches directly to the handlebar to keep beverages within reach. Your beverage sways safely with the motion of the stroller as you go. Keep your smallest family member cozy in a compact or deluxe pram.